Everybody knows somebody who can strum a simple tune on the guitar, be it a Bob Marley classic or a campfire-friendly Jack Johnson number. In recent years, people have in increasing numbers turned to the earthly, organic sound of slide guitar. So what is slide guitar? It's a question more than a few friends have asked this particular guitar nerd - many quickly realising they've unleashed a monster and wishing they'd never asked. To fuel my obsession, I paid a visit to Sydney Guitar Tuition founder Robert Thorne at his home in Randwick. When we sat down in Thorne's studio, he asked me the standard question: "How long have you been playing? I answered with the true story of how I took guitar lessons as a teenager and was going great guns until my mum banned me for playing up at school. The ban didn't last long. Thorne approved. "Nice... very rock 'n' roll." So we tuned up, Thorne on a Maton acoustic and myself on a resonator guitar, and it was immediately obvious that Thorne can play. He's been at it for 30 years and has been teaching since 1985. Nowadays, he has about 80 students on the books, the youngest aged seven, and the oldest was 68. He teaches anything from classical to contemporary rock - but his specialty is the blues, the main genre associated with slide guitar. Perhaps the most popular form of slide guitar is the bottleneck-style, which involves a copper, glass or metal slide being pressed against the strings of an acoustic or electric guitar. Unlike most instruments, slide guitar has the gift of being able to mimic the human voice. It has a richness that captures both sweetness and edge - and boy, does it sound good. We tuned up and got low down and dirty with some Delta blues riffs. 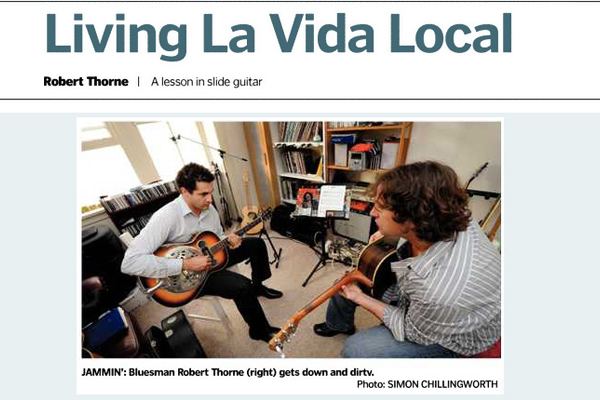 "The thing with slide guitar is that it can be a bit more freeing and fluent," Thorne said. "It's hard to get away from the blues sound - it definitely stirs up the emotions. It's very organic, very 'rootsy'." Thorne showed me a rhythm first and after some fiddling around he let me play lead. I was surprised at how easy these classic blues riffs were to play. Bottleneck-style slide is definitely fun, even if you're not into the blues, but it does have its limitations. "Everything went so techno there for a while and now it's coming back..."
strings raised at least 2cm above the fretboard is placed flat on the lap. It's played horizontally with a metal bar rather than a slide, making it much more useful for soloing and playing melodies on all strings. Having said that, the better exponents of bottleneck like Jeff Lang and Bob Brozman play it as effortlessly as they play lap-style guitars like the Weissenborn. These Hawaiian guitars have enjoyed resurgence in recent years, partly due to the rise in the popularity of blues-based roots music. "I think it's just part of the cycle in music," Thorne said. "Everything went so techno there for a while and now it's coming back to the more organic sound of people like Jack Johnson." After about an hour of jamming we put down our guitars, reluctantly. A crash course in slide - if nothing else, it armed me with a few little tricks to take back home to the spare room. 2017 © Sydney Guitar Tuition. All rights Reserved | Designed and Hosted by Design Shore Technologies Australia Pty Ltd.